Twenty-four year-old Katie Gariepy grew up in New Hampshire and has lived in Buffalo half of her life. As a daughter of two artists, and growing up with a very artsy background, she knew becoming an artist of some kind would be in her future. She started designing young and hasn’t stopped since. “When I was around 15 I would take my old clothes and reconstruct them into something new. Then I started selling them online and purchasing fabrics and other clothing to transform. It took off and became something I wanted to do all of the time! I opened my Etsy right around the beginning of Etsy itself. I haven’t stopped creating and selling since,” she said. After being involved with PEAR Planning’s White Party last year (photo left), which featured all white designs, Katie loves to get involved with any show or project she can. 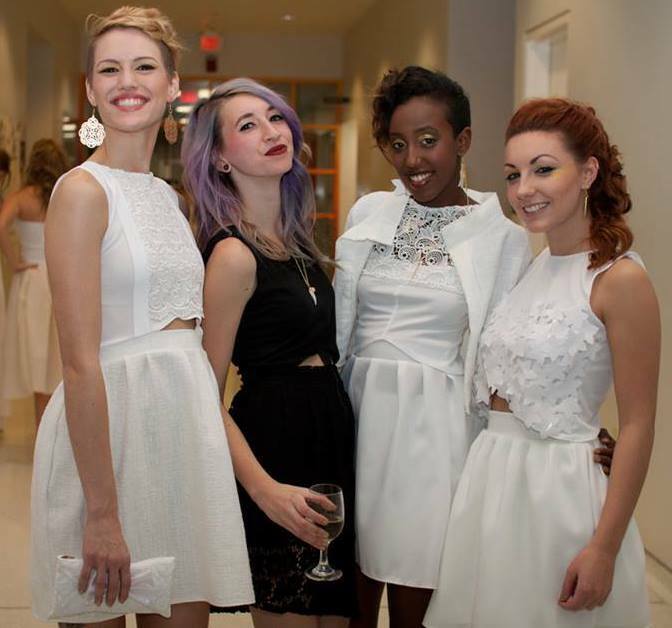 She also participated in Mass Appeal and designed handbags Buffalo State’s Runway 7.0. Recently Katie was cruising the internet and found out about Kiva, a website that helps businesses grow with 0% interest loans. Their moto is, “making a small loan can change a life.” Hopefully with the help of Kiva her designs will only get bigger and better. As a one-woman-business Katie does it all and sees through all her designs personally from start to finish. Her Fall/Winter collection is coming up soon and we’re excited to she what she’s bringing to the table. If you haven’t checked out her Etsy shop put that on your to do list!